"Maurice Williams & The Zodiacs - Stay"
"She's Like the Wind" is a 1987 power ballad from the film Dirty Dancing, performed by Patrick Swayze. Though Swayze is the primary vocalist on the single, it was billed as being performed by "Patrick Swayze & Wendy Fraser”. Fraser is heard throughout much of the song, specifically in the final chorus. The single reached number three on the Billboard Hot 100 and number one on the Adult Contemporary chart. Swayze and Stacy Widelitz co-wrote the song in 1984. Swayze co-wrote and performed two tracks on the soundtrack to the film Road House (1989), plus he co-wrote and performed a duet with Larry Gatlin for the film Next of Kin (1989). The music video in black and white features clips from the movie Dirty Dancing. The video can be seen on the Ultimate Dirty Dancing DVD. The song was released commercially on 7" vinyl in many countries, with a 3-track 12" maxi single and 2-track cassette also produced. CD singles were a relatively new format, however; a 2 and 3-track 5" CD and Japanese mini CD single were commercially released. (2006) "She's Like the Wind"
"She's Like the Wind" is a cover recorded by American recording artists Lumidee and Tony Sunshine for Lumidee's second album, Unexpected (2007). It was released as the lead single from Unexpected in the US and Europe on April 3, 2007. 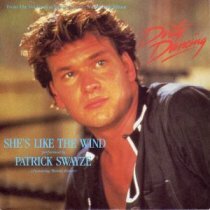 According to Lumidee, the idea to record a remake of Patrick Swayze's 1987 song "She's Like The Wind" was inspired by her European label when she recommended a collaboration with fellow New York recording artist Tony Sunshine. She also said, "We'd been talking about working together but hadn't been able to. But he loved the idea of doing something with this song." The music video for this version was directed by Dayo. The song was later covered by Vibekingz featuring Maliq, Phonkillaz (2002), and Patrick Nuo, and in 2007 by Lumidee featuring Tony Sunshine, released on Lumidee's album Unexpected. The Vibekingz version reached #2 on Germany's pop charts in 2006, and stayed in the top ten for two months. The version by Lumidee received widespread airplay in the United States, reaching the top 20. Tony Sunshine sings the original part by Swayze, while Lumidee raps with original verses related to the theme of the song. A mashup song and video of "She's Like the Wind" with "Minimal" by Pet Shop Boys has been a featured video on YouTube. Girls Aloud covered "She's Like the Wind" in the Dirty Dancing Medley on their The Sound of Girls Aloud: The Greatest Hits Tour; it was Kimberley Walsh's solo. Ultrabeat covered the song on their 2008 album, Discolights: The Album. Jan Wayne covered it on his album Back Again. Performed as a tribute to Patrick Swayze on Season 9 Dancing with the Stars Result Show by Dmitry Chaplin and Chelsie Hightower. John Sage covered the song as a single release in 2013. Boston artist Michael Spaulding also covered the song for his new album released in 2013. The song is briefly used in a scene of the 2009 movie (500) Days of Summer. Swaytrick released their She's Like the Wind (Club Mixes) album in 2014. Besides the original Swaytrick versions the album features summery house remixes by The Moodshapers. Urban Zouk Music Producer Jay Bee did a bootleg remix of the song in 2015. Calum Scott performed a version used in the 2017 TV movie version of Dirty Dancing. ^ McNelis, Tim. "Dancing in the Nostalgia Factory: Anachronistic Music in Dirty Dancing". In The Time of Our Lives: Dirty Dancing and Popular Culture. Eds. Yannis Tzioumakis & Siân Lincoln. Detroit: Wayne State University Press, 2013. P. 250. ^ Naish, Stephen Lee (28 April 2017). "Deconstructing Dirty Dancing". John Hunt Publishing – via Google Books. ^ Whitburn, Joel (2002). Top Adult Contemporary: 1961-2001. Record Research. p. 238. ^ "Item Display - RPM - Library and Archives Canada". Collectionscanada.gc.ca. 1988-03-12. Retrieved 2018-11-30. ^ "Item Display - RPM - Library and Archives Canada". Collectionscanada.gc.ca. 1988-03-26. Retrieved 2018-11-30. ^ (Posted: March 26, 2007) Elena del Valle, Puerto Rican singer Lumidee launches second album in April 2007 hispanicmpr.com. Poyeen Publishing. Retrieved 10-31-2010. ^ (Posted: March 24, 2007) Gail Mitchell, "R&B singer Lumidee rejects one-hit-wonder tag" reuters.com. Retrieved 1-31-2010. 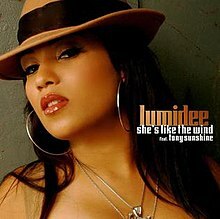 ^ Lumidee, "She's Like The Wind" (Feat. Tony Sunshine) - Music videos Archived 2009-04-29 at the Wayback Machine BET.com. Retrieved 10-31-10. ^ "Ultratop.be – Lumidee feat. Tony Sunshine – She's Like The Wind" (in Dutch). Ultratop 50. ^ "Ultratop.be – Lumidee feat. Tony Sunshine – She's Like The Wind" (in French). Ultratop 50. ^ "Danishcharts.com – Lumidee feat. Tony Sunshine – She's Like The Wind". Tracklisten. ^ "Lumidee Chart History (Hot 100)". Billboard. ^ "Lumidee Chart History (Pop Songs)". Billboard. ^ "Lumidee Chart History (Hot R&B/Hip-Hop Songs)". Billboard. "Never Leave You (Uh Oooh, Uh Oooh)"
"Die besten Tage sind gezählt"
"Don't Sweat That (Whistle Song)"
This page was last edited on 22 February 2019, at 19:16 (UTC).